Dan Magone on the deck of the Arctic Hunter, with debris visible on the beach. Photo by Annie Ropeik, KUCB – Unalaska. 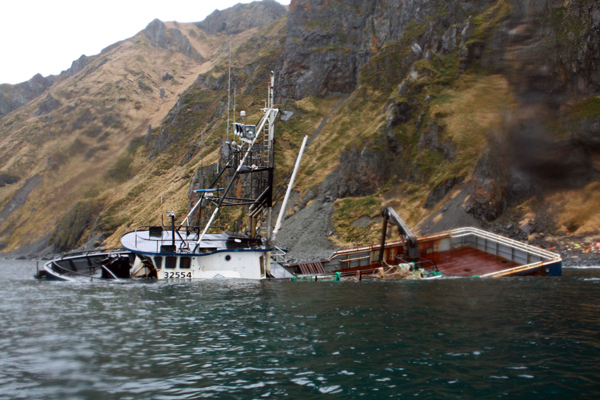 The grounded crab boat Arctic Hunter has been stuck on the rocks outside Unalaska for more than two months now. Dan Magone of Resolve-Magone Marine Services has been working on a plan to remove the wreck. Right now, the Hunter is at the mercy of the elements. So what happens to a shipwreck while it’s waiting to be saved? It’s easy to miss the Arctic Hunter until you’re almost at its bow. “Just go right over there, just inside of that – yeah, right straight ahead would be good, I think…,” Dan Magone said. The 93-foot crab boat is tipped to the side, half-submerged in Unalaska Bay. It looks small at the foot of the cliffs, and its blue hull blends in with the water. Dan Magone and his son and employee Cecil Magone have taken a skiff out to the Hunter. The wreck is tilting toward us where we’re anchored, and we can see it listing back and forth. 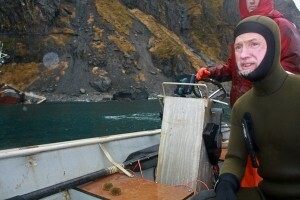 Dan Magone snorkeling in front of the Arctic Hunter. 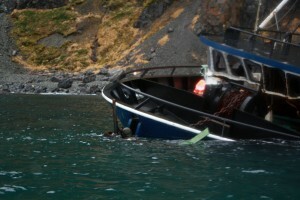 Photo by Annie Ropeik, KUCB – Unalaska. The Hunter has been stuck here a lot longer than your typical wreck, since November 1st. But it’s jammed into the rocks pretty securely, and all of its fuel either spilled just after the grounding, or has since been removed. It’s not an environmental hazard anymore. So the boat’s insurance company is taking its time getting the wreck removal started. It’s not going to be an easy job, and there aren’t many breaks in the weather on this part of the coastline. The delay has given Dan Magone more time to fine-tune his wreck removal proposal. Today is the last planning trip he’s going to make. After months of pounding by waves and wind, the Hunter can’t float on its own. Salvagers will need to clear a path in the rocks and drag it out to deeper water before they can work on it. It’s raining and windy today – typical weather for Unalaska Bay, and for Dan, time to go snorkeling. He straps on a wetsuit, fins and mask and dives into what’s probably 40-degree water to swim out to the boat. Dan Magone and his sea urchins in the skiff after the survey dive. Photo by Annie Ropeik, KUCB – Unalaska. 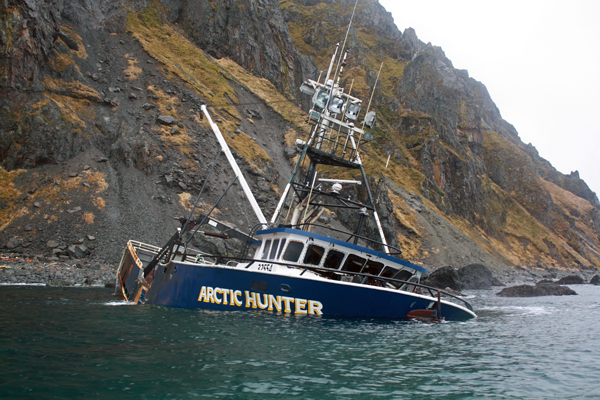 From where the skiff stays anchored, we can see that the Arctic Hunter has taken a beating. There’s no glass left in most of its cabin windows, and the window frames are crunched in and starting to rust. Cecil says that’s pretty typical with a wreck that’s been out here so long. And anything that’s not tied down is likely to wash out. Dan finds huge wrenches in the water next to the Hunter as he snorkels around. “Nice one, two and a half… Those are expensive,” Dan said. He brings them back to the side of the skiff and tosses them in. “Treasure!” Dan exclaimed as he tosses the wrench in the skiff. Cecil says these wrenches probably fell out of the engine room. They’d sink or wash ashore if Dan didn’t collect them. More things are already visible on the rocky beach behind the Hunter – like plywood and insulation from the boat’s interior, plus smaller objects. Photo by Annie Ropeik, KUCB – Unalaska. At least what we can see of the hull is intact. But Cecil says it’s a different story below the waterline. Cecil says salvagers will have to get the boat off the rocks and patch it up to float it again. Then they can take it to somewhere like a dry dock. But Cecil isn’t optimistic much of the Hunter will be saved. “This thing’s going to be so mangled that you’re pretty much – anywhere you take it, you’re probably just going to have to cut it up into smaller pieces,” Cecil said. For now, the survey work is done. Dan surfaces at the side of the skiff and climbs back in. He cuts them open and we snack on them as we head away from the Hunter. The Arctic Hunter is becoming part of the landscape out here. Like the rocks that have taken root in its hold, it’s taken root against the beach. The wreck will only break down and blend in more the longer it waits. Annie Ropeik is a reporter for KUCB in Unalaska.